I awoke this morning with something dreadfully wrong with my knee...old age I suppose. So instead of taking my morning walk before breakfast, I headed for the studio to sit and hopefully finish up the small commission I am working on. This is a shot of my studio still in a mess. The portrait on the wall is one I abandoned a few years back of myself holding Picasso, my siamese. When we got Picasso, I had my husband attach two boards of soft wood onto my makeshift taboret (an old microwave cart). It is visible in the forground on the right. This has saved my furniture as well as my oak easel which is not in the photo. My studio has three windows which catch the southeast, south and southwest sunlight. Not too good for an artist. Although the studio is always too warm, which I like, I have to position my back to the window that is getting most of the light at that particular time of day. 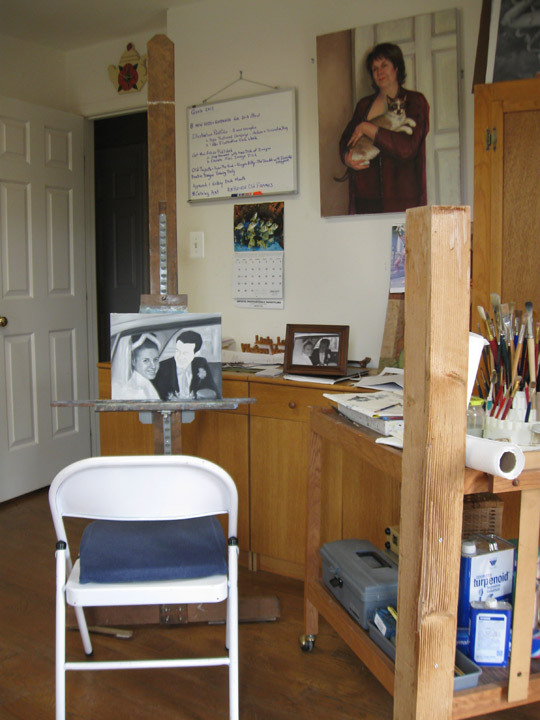 So I find myself rotating the easel, chair and taboret throughout the day. I will usually stand to paint when working on a large piece, such as Minerva. She is at the other end of the studio on my oak easel. I also have a computer and file cabinets, a desk, plus one entire wall with cabinets and shelves, not visible in the photo. A bit cramped, but works for me! Oh, and I have my CD Player Boom Box from the 80's as well as an I-pod for the must have loud rock and roll!!! Gets the blood pumping! Nothing new to show you, except this little miniature I started four weeks ago at the Ice House studio. 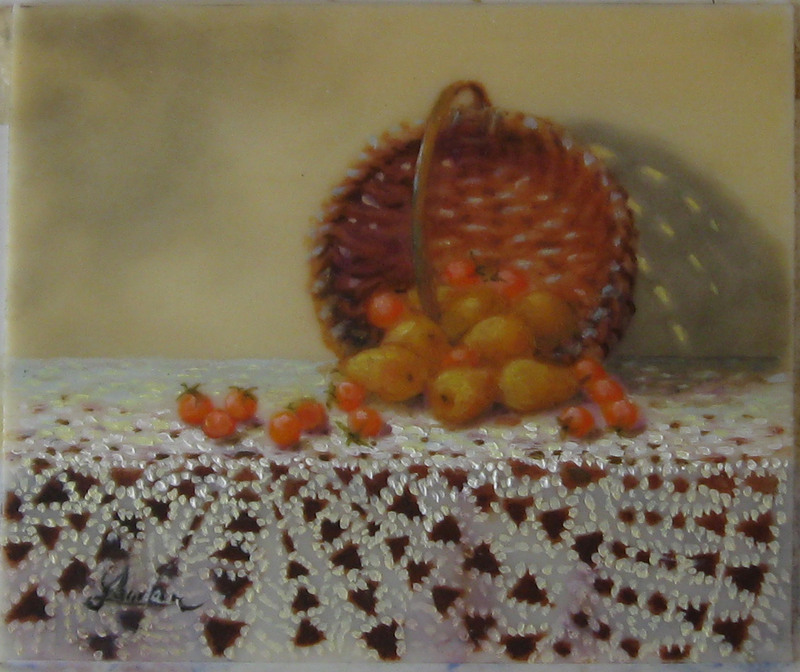 It is about three quarters finished and measures 2 1/4 " x 3 1/4" and is oil on ivorine. I have not had time to resume work on it, the move and some client work that takes prority right now. I am still merging my two studios back to one location and have not done anything new or resumed any of my personal projects. I am however continuing to work on two client commissioned pieces for part of the day. I work on those pieces before getting exhausted with the cleaning out and organizing of the studio. I emptied out the gallery/studio in Little Washington yesterday. I will miss the focus and visitors, but am truely glad to be back in my warm and comfortable studio again.......and having a toilet again is a huge plus. The landlords had told me prior to signing a second lease two years ago, that they were going to put in a toilet for me since they LIKED me so much. That never happened and I endured two more years of gas station runs and the embarassement of no toilet for my customers and borrowing toilets all around town. Oh Well, that chapter has closed and now begins another chapter. I am cleaning out the studio today and making room for what I had at the gallery/studio. Some items will end up in storage of course, but now I will have all supplies and paints in one location. Also I will have two, maybe three easels set up in this tiny studio, since I like to work on two or three things at once. The old saying, When God closes a door, he opens a window........I am waiting for that window to appear. Although I am feeling a bit under the weather, the dress has been blocked in. Not anywhere close to finished, but a good start. Here it is.....the background. I am very pleased with it and the little Mona Lisa was so much fun to stick in there. You probably can't really see the chemistry bottles at the bottom of this picture, but they are there and are looking very good. I still want to do much more work to The Thinker behind Rose. I hope to start on her dress tomorrow. I am loving the new camera. I think my photos are looking better. The underpainting of Fastmatte paint dried very quickly. Too Quickly for my technique. And so, today I am repainting the background. I purchased a new color "Sepia" for my trip last June to the IMC and never used it while there. As a matter of fact, I had never used Sepia before. Since I am in an experimental mood these days, I pulled it out this morning and have been using it in the background to get a very rich greenish black/brown color. Very Nice!!! Almost as nice as my Sap Green and Alizarin Crimson background mix. Pictures to come shortly......when there is something that you can recognize on the canvas. I received a free sample (3 tubes) of Gamblin's new Fastmatte, fast drying oil colors for underpainting and matte surfaces. I had entered the Torrit Grey competition they hold and this was my runner up prize. Obviously I did not win, you would have heard my cheers long before now. Anyway, my painting of Medusa Turning To Stone is on their website, Gamblin Artist's Colors and on the Torrit Grey Competion website. 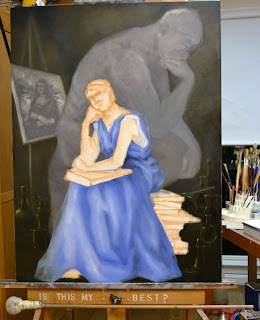 I used the three colors sent to me to do an underpainting on the Minerva painting. I normally never do an underpainting, but figured this would be a good time to give it a try. My normal procedure is to do an indepth grisaille or else tone a canvas and then do a placement sketch. For Minerva I have done neither. Instead of toneing the canvas, I placed a light compositional sketch. 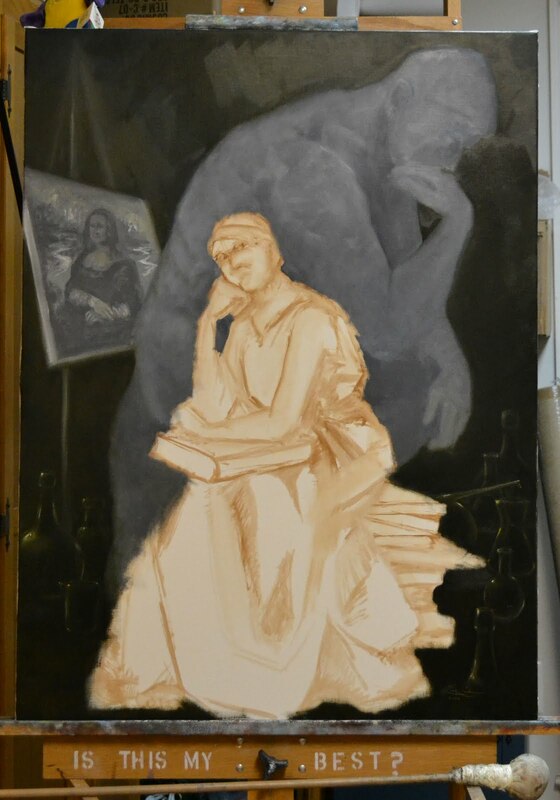 Today I have used the Fastmatte colors to create a grey underpainting of the background. MY FINDINGS: Fastmatte is very good for a fastdrying tint or underpainting. If you like Acrylics you will love this product. On the other hand, if you are a traditional slow painter like myself, these are not for you. They dry too fast for my style of painting. Even when turpenoid was used to thin them, they did not stay open long enough for my traditional soft hazy background technique. I had difficulty with blending and feathering the colors. BUT, I will use them to quickly tone a canvas. I may also use them to do small illustrations that need to be finished quickly for a deadline. I got to see the Mummy exhibit at the Virginia Museum of Fine Art during the holidays and thoroughly enjoyed it. My husband and I share a love of Archeology and Ancient Egypt. I was most impressed with the decorations on the mummy case. They used natural pigments and the colors were still so rich and vibrant after all these thousands of years. There was a papyrus sheet of paper with hierogliphics and drawings on it in ink. The penmanship and decoration was phenominal, so exacting and precise. All these tiny little lines which looked to have been drawing with a mechanical implement, but were done with a steady hand. I really got excited when I saw a mummified cat wrapped in intricately folded linen strips which formed a beautiful geometric design. Then I read that the cats did not all die of natural causes, but were often killed by a blow to the head..........oh how that ruined my day. OK. back to work now.....I have resumed work on Minerva and will blog about that later today. 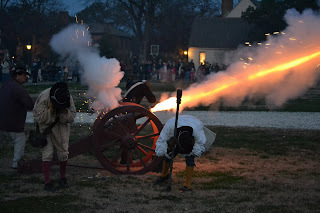 This year we spent Christmas in Williamsburg VA. We had our new camera and this is the phenominal photo taken on Christmas Eve at the firing of the cannons and lighting of the town square Christmas Tree. It was magical. Everyone carrying little candles and singing carols in the dark. Speeches by the Mayor and others and a reading of the Night Before Christmas on the courthouse steps. Then the tree was lit. Drums and Fifes and militia men marched up and down the streets with men carrying braziers. This has always been our favorite and romantic getaway. It really was a wonderful Christmas.